Chopin himself presented his date as the 1st of March, 1810, as presented in his letter dated 1/16/1833 to the Head of the Literary Society in Paris. The same date is given in the letters of his Scottish pupil Jane W. Stirling, saying that “his parents made an error of eight days when they went to the registry office some weeks after his birth.”: Sources for February 22nd: Chopin by Henri Bidou; also Sabian Symbols, and Notable Nativities) Died, October 17, 1849, Paris, France. Frederick Chopin was one of the greatest pianists of the 19th century and, in the eyes of many, the greatest of all composers for the piano. Many of his pieces are dreamy, delicate, shimmering, opalescent (Sun in Pisces, Moon in Libra); others have the raw power, vigor and irrepressibility of the military (Mars and Jupiter in Aries). We find in Chopin a blend of the fourth sixth and seventh rays, with the fourth being the probably soul ray. A number of sensitive artists were ‘sent in’ (into incarnation) “before their time” (and, reasonably, under Neptune) in an attempt to offset the gathering materialism which later engulfed the world in the late 19th and the first half of the 20th century. Chopin was just such a sensitive soul. From a certain perspective, however, it seemed that the burning passion of his soul was too great for the delicate strength of his body, and he was consumed by the fire. He died of tuberculosis at the age of thirty nine. All the same it is being said everywhere that I played too softly, or rather, too delicately for people used to the piano-pounding of the artists here. I don’t know how it is, but the Germans are amazed at me – and I am amazed at them for finding anything to be amazed about! They want me to give another concert but I have no desire to do so. You cannot imagine what a torture the three days before a public appearance are to me.I wish I could throw off the thoughts which poison my happiness. And yet I take a kind of pleasure in indulging them. 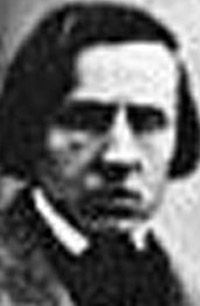 (March 1, 1810 – October 17, 1849) was a Polish pianist and composer. He is widely regarded as one of the most famous, influential and admired composers for the piano. 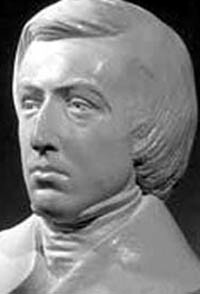 He was born Fryderyk Franciszek Chopin in the village of Zelazowa Wola, Poland, to a Polish mother and French expatriate father. Hailed as a child prodigy in his homeland, Chopin left for Paris at the age of 20. In Paris, he made a career as a performer and teacher as well as a composer, and adopted the French variant of his name, "Frédéric-François". He had a turbulent 10-year relationship with the French writer George Sand from 1837 to 1847. Always in fragile health, he succumbed to pulmonary tuberculosis at the age of 39. Chopin was born in Zelazowa Wola in central Poland near Sochaczew, in the region of Masovia, which was part of the Duchy of Warsaw. He was born to Mikolaj (Nicolas) Chopin, a Frenchman of distant Polish ancestry who adopted Poland as his homeland when he moved there in 1787, and married Tekla Justyna Krzyzanowska, a Pole. 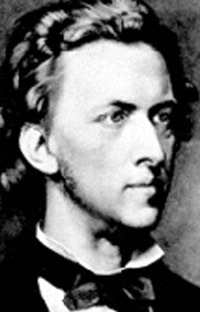 According to the composer's family, Chopin was born on March 1, 1810, and he always celebrated his birthday on this day. His baptismal certificate lists his date of birth as February 22, but this was most likely an error on the part of the priest (the certificate was written on 23 April, almost eight weeks after the birth). Frédéric François Chopin, by Ary Scheffer.The family moved to Warsaw in October 1810. The young Chopin's musical talent was apparent early on in his life, and in Warsaw he gained a reputation as a "second Mozart". At the age of 7 he was already the author of two polonaises (in G minor and B-flat major), the first being published in the engraving workshop of Father Cybulski, director of the School of Organists and one of the few music publishers in Poland. The prodigy was featured in the Warsaw newspapers, and "little Chopin" became the attraction at receptions given in the aristocratic salons of the capital. He also began giving public charity concerts. At one concert, he is said to have been asked what he thought the audience liked best. 7-year-old Chopin replied, "My shirt collar." He performed his first piano concert at age 8. His first professional piano lessons, given to him by the violinist Wojciech Zywny (born 1756 in Bohemia), lasted from 1816 to 1822. Chopin later spoke highly of Zywny, although Chopin's skills soon surpassed those of his teacher. Warsaw flat once occupied by Chopin.The further development of Chopin's talent was supervised by Wilhelm Würfel (born 1791 in Bohemia). This renowned pianist, a professor at the Warsaw Conservatory, gave Chopin valuable (although irregular) lessons in playing organ, and possibly piano. From 1823 to 1826, Chopin attended the Warsaw Lyceum, where his father was a professor. In the autumn of 1826, Chopin began studying music theory, figured bass, and composition with the composer Józef Elsner (born 1769 in Silesia) at the Warsaw Conservatory. 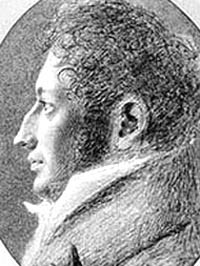 Chopin's contact with Elsner may date to as early as 1822, and it is certain that Elsner was giving Chopin informal guidance by 1823. In 1829 in Warsaw, Chopin heard Niccolò Paganini play, and he also met the German pianist and composer Johann Nepomuk Hummel. It was also back in 1829 that Chopin met his first love, a singing student named Konstancja Gladkowska. This inspired Chopin to put the melody of the human voice into his works. Chopin also paid his first visit to Vienna in that year, where he gave two piano performances and received mixed notices, including many very favourable reviews and others that criticised the small tone he produced from the piano. In Warsaw in December he performed the premiere of his Piano Concerto in F minor at the Merchants' Club. He gave the first performance of his other piano concerto, in E minor at the National Theatre on 17 March 1830. He visited Vienna again in 1830, playing his two piano concertos. In Vienna, he learned about the November Uprising and decided not to return to Poland, thus becoming one of the émigrés of the Great Polish Emigration. He stayed in Vienna for a few more months before visiting Munich and Stuttgart (where he learned of Poland's occupation by the Russian army), and arrived in Paris early in October. He had already composed a body of important compositions, including his two piano concertos and some of his Études Op. 10. In Paris, Chopin was introduced to some of the foremost pianists of the day, including Friedrich Kalkbrenner, Ferdinand Hiller and Franz Liszt, and he formed personal friendships with the composers Hector Berlioz, Felix Mendelssohn, Charles-Valentin Alkan, and Vincenzo Bellini (beside whom he is buried in the Père Lachaise). His music was already admired by many of his composer contemporaries, among them Robert Schumann who, in his famous review of the Variations on "La ci darem la mano", Op. 2, wrote: "Hats off, gentlemen! A genius". From Paris, Chopin made various visits and tours. In 1834, with Hiller, he visited a Rhenish Music Festival at Aachen organised by Ferdinand Ries. Here Chopin and Hiller met up with Mendelssohn and the three went on to visit Düsseldorf, Koblenz and Cologne, enjoying each other's company and learning and playing music together. Chopin participated in several concerts during his years in Paris. The programs of these concerts provide some idea of the richness of Parisian artistic life during this period, such as the concert on March 23 1833 in which Chopin, Liszt and Hiller played the solo parts in a performance of Johann Sebastian Bach's concerto for three harpsichords, or the concert on March 3 1838 when Chopin, Charles-Valentin Alkan, Alkan's teacher Pierre Joseph Zimmerman and Chopin's pupil Adolphe Gutman played Alkan's 8-hand arrangement of Beethoven's seventh symphony. A distinguished English amateur described seeing Chopin at a salon. Imagine a delicate man of extreme refinement of mien and manner, sitting at the piano and playing with no sway of the body and scarcely any movement of the arms, depending entirely upon his narrow feminine hand and slender fingers. The wide arpeggios in the left hand, maintained in a continuous stream of tone by the strict legato and fine and constant use of the damper pedal, formed a harmonious substructure for a wonderfully poetic cantabile. His delicate pianissimo, the ever-changing modifications of tone and time (tempo rubato) were of indescribable effect. Even in energetic passages he scarely ever exceeded an ordinary mezzoforte. In 1835 Chopin visited his family in Karlsbad, whence he accompanied his parents to Decín where they lived, and then to Warsaw. He returned to Paris via Dresden, where he stayed for some weeks, and then Leipzig where he met up with Mendelssohn, Robert Schumann and Clara Wieck. However on the return journey he had a severe bronchial attack - so bad that he was reported dead in some Polish newspapers. In 1836 Chopin was engaged to a seventeen-year-old Polish girl named Maria Wodzinska, whose mother insisted that the engagement be kept secret. The engagement was called off in the following year by her family. Frédéric François Chopin as portrayed by his friend Eugène Delacroix in 1838. Originally this painting and the George Sand portrait (shown below) were part of a larger double portrait showing both of them. George Sand by Eugène Delacroix.In 1836, at a party hosted by Countess Marie d'Agoult, mistress of fellow composer Franz Liszt, Chopin met Amandine-Aurore-Lucile Dupin, Baroness Dudevant, better known by her pseudonym George Sand. She was a French Romantic writer, noted for her numerous love affairs with such prominent figures as Prosper Merimée, Alfred de Musset (1833–34), Alexandre Manceau (1849–65), and others. The composer initially did not consider her attractive. "Something about her repels me," he said to his family. However, in an extraordinary letter from Sand to her friend Count Wojciech Grzymala in June 1837, she debated whether to let Chopin go with Maria Wodzinska or whether to abandon another affair in order to start a relationship with Chopin. Sand had strong feelings and was attracted to Chopin, and pursued him until a relationship began. A notable episode in their time together was a turbulent and miserable winter on Mallorca (1838–1839), where they had problems finding habitable accommodation and ended up lodging in the scenic, but stark and cold Valldemossa monastery. Chopin also had problems having his Pleyel piano sent to him. It arrived from Paris after a great delay, to be stuck at the Spanish customs who demanded a large import duty. He could only use it for a little more than three weeks; the rest of the time he had to compose on a rickety rented piano to complete his Preludes (Op. 28). During the winter, the bad weather had such a serious impact on Chopin's health and his chronic lung disease that, to save his life, he and George Sand were compelled to return first to the Spanish mainland where they reached Barcelona, and then to Marseille where they stayed for a few months to recover. Although his health improved, he never completely recovered from this bout. He complained about the incompetence of the doctors in Mallorca: "The first said I was going to die; the second said I had breathed my last; and the third said I was already dead." Chopin spent the summers of 1839 until 1843 at Sand's estate in Nohant. These were quiet but productive days, during which Chopin composed many works. On his return to Paris in 1839, he met the pianist and composer Ignaz Moscheles. In 1845 a serious problem emerged in Chopin's relationship with Sand at the same time as a further deterioration in Chopin's health. Their relationship was further soured in 1846 by family problems; this was the year in which Sand published Lucrezia Floriani, which is quite unfavourable to Chopin. The story is about a rich actress and a prince with weak health, and it is possible to interpret the main characters as Sand and Chopin. The family problems finally brought an end to their relationship in 1847. Church of the Holy Cross in Warsaw. Chopin's bust is visible on the left-most pillar, and is also the location of his heart.In 1848 Chopin gave his last concert in Paris, and visited England and Scotland with his student and admirer Jane Stirling. They reached London in November, and, although Chopin managed to give some concerts and salon performances, he was severely ill. He returned to Paris where in 1849 he became unable to teach or perform. His sister Ludwika nursed him at his home in the Place Vendôme; he died there in the small hours of October 17. Later that morning a death mask and a cast of Chopin's hands were made. He had requested that Mozart's Requiem be sung at his funeral, which was held at the Church of the Madeleine and was attended by nearly three thousand people. The Requiem has major parts for female singers but the Madeleine had never permitted female singers in its choir. The funeral was delayed for almost 2 weeks, until the church finally relented and granted Chopin's final wish provided the female singers remained behind a black velvet curtain. Also performing was the bass Luigi Lablache, who had also sung the same work at the funerals of Beethoven and Bellini. Although Chopin is buried in the Père Lachaise cemetery in Paris; at his own request, his heart was removed and dispatched in an urn to Warsaw, where it is sealed in a pillar in the Church of the Holy Cross (Kosciól Swietego Krzyza). The Père Lachaise site attracts numerous visitors and is invariably festooned with flowers, even in the dead of winter. Chopin's music for the piano combined a unique rhythmic sense (particularly his use of rubato, frequent use of chromaticism, and counterpoint). This mixture produces a particularly fragile sound in the melody and the harmony, which are nonetheless underpinned by solid and interesting harmonic techniques. He took the new salon genre of the nocturne, invented by Irish composer John Field, to a deeper level of sophistication, and endowed popular dance forms, such as the Polish mazurka and the Viennese waltz, with a greater range of melody and expression. Chopin was the first to write Ballades (a genre he invented) and Scherzi as individual pieces. Chopin also took the example of Bach's preludes and fugues, transforming the genre in his own preludes. 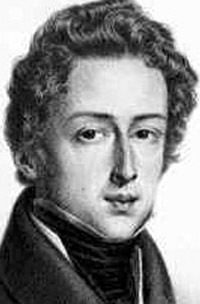 Chopin in 1847. Drawing by Winterhalter.Several of Chopin's melodies have become very well known - for instance the Revolutionary Étude (Op. 10, No. 12), the Minute Waltz (Op. 64, No. 1), and the third movement of his Funeral March sonata (Op. 35), which is often used as an iconic representation of grief. The Revolutionary Étude was not written with the failed Polish uprising against Russia in mind, it merely appeared at that time. The Funeral March was written as a funereal piece, but it was not inspired by any recent personal bereavement. Other melodies have been used as the basis of popular songs, such as the slow section of the Fantaisie-Impromptu (Op. 66) and the first section of the etude Op. 10 No. 3. These pieces often rely on an intense and personalized chromaticism, as well as a melodic curve that resembles the operas of Chopin's day - the operas of Gioacchino Rossini, Gaetano Donizetti, and especially Bellini. Chopin used the piano to re-create the gracefulness of the singing voice, and talked and wrote constantly about singers. Chopin's style and gifts became increasingly influential: Schumann was a huge admirer of Chopin's music — although the feeling was not mutual — and he took melodies from Chopin and even named a piece from his suite Carnaval after Chopin. Franz Liszt, another great admirer and personal friend of the composer, transcribed six of Chopin's songs for piano. Liszt later dedicated a movement of his Harmonies Poétiques et Religieuses to Chopin, titling it Funérailles and subtitling it "October 1849." The mid-section recalls powerfully the famous octave trio section of Chopin's Polonaise, op. 53. Despite this, Liszt denied it had been inspired by Chopin's death but by the deaths of three of Liszt's Hungarian compatriots in the same month. Chopin's technical innovations also became influential. His préludes (Op. 28) and études (Op. 10 and 25) rapidly became standard works, and inspired both Liszt's Transcendental Études and Schumann's Symphonic Études. Alexander Scriabin was also strongly influenced by Chopin; for example, his 24 Preludes op.11 are inspired by Chopin's Op.28. 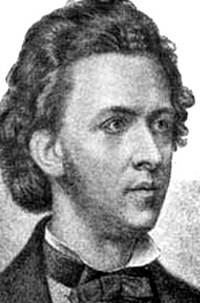 Jeremy Siepmann, in his biography of the composer, named a list of pianists he believed to have made recordings of works by Chopin generally acknowledged to be among the greatest Chopin performances ever preserved: Idil Biret, Vladimir de Pachmann, Raoul Pugno, Ignacy Jan Paderewski, Moriz Rosenthal, Sergei Rachmaninoff, Alfred Cortot, Ignaz Friedman, Raul Koczalski, Arthur Rubinstein, Mieczyslaw Horszowski, Claudio Arrau, Vlado Perlemuter, Vladimir Horowitz, Dinu Lipatti, Vladimir Ashkenazy, Martha Argerich, Maurizio Pollini, Murray Perahia, Krystian Zimerman, Evgeny Kissin. Chopin regarded the Romantic movement with indifference, and rarely associated himself with it directly. Even so, today Chopin's music is considered to be the paragon of the Romantic style. However, his music has less of the expected trappings of Romanticism: There is a classical purity and discretion in his music, with little Romantic exhibitionism, personified by his reverence of Bach and Wolfgang Amadeus Mozart (Chopin based the structure of his preludes on the Well-tempered Clavier of Bach). Chopin also never indulged in 'scene painting' in his music or affixing to his works fanciful or descriptive titles, unlike his contemporary Robert Schumann. In addition, unlike his flamboyant contemporary Franz Liszt, Chopin was withdrawn from public life. All of Chopin's works involve the piano, whether solo or accompanied. They are predominantly for solo piano but include a small number of piano ensembles with instruments including a second piano, violin, cello, voice, and orchestra. His larger scale works such as the four ballades, the four scherzos, the barcarolle op. 60, the fantaisie op. 49, and sonatas have cemented a solid place within the repertoire, as well as shorter works like his impromptus, mazurkas, nocturnes, waltzes and polonaises. Two important collections are the 24 Preludes Op. 28, based loosely on Bach's Well-Tempered Clavier, and the études Op. 10 and Op. 25, which are a staple of that genre for pianists. Chopin composed two of the romantic piano concerto repertoire's most often-performed examples, his Opp. 11 and 21. In addition, he wrote several song settings of Polish texts, and chamber pieces including a piano trio and a sonata for cello and piano. Fryderyk Franciszek Chopin, the Polish composer and pianist, was born on 1 March 1810, according to the statements of the artist himself and his family, but according to his baptismal certificate, which was written several weeks after his birth, the date was 22 February. His birthplace was the village of Zelazowa Wola near Sochaczew, in the region of Mazovia, which was part of the Duchy of Warsaw. The manor-house in Zelazowa Wola belonged to Count Skarbek and Chopin's father, Mikolaj (Nicolas) Chopin, a Polonized Frenchman, was employed there as a tutor. He had been born in 1771 in Marainville in the province of Lorraine in France, but already as a child he had established contacts with the Polish families of Count Michal Pac and the manager of his estate, Jan Adam Weydlich. At the age of 16, Mikolaj accompanied them to Poland where he settled down permanently. He never returned to France and did not retain contacts with his French family but brought up his children as Poles. In 1806, Mikolaj Chopin married Tekla Justyna Krzyzanowska, who was the housekeeper for the Skarbek family at Zelazowa Wola. They had four children: three daughters: Ludwika, Izabela and Emilia, and a son Fryderyk, the second child. Several months after his birth, the whole family moved to Warsaw, where Mikolaj Chopin was offered the post of French language and literature lecturer in the Warsaw Lyceum. He also ran a boarding school for sons of the gentry. In the autumn of 1826, Chopin began studying the theory of music, figured bass and composition at the Warsaw School of Music, which was both part of the Conservatory and, at the same time, connected with Warsaw University. Its head was the composer Jozef Elsner (b. 1769 in Silesia). Chopin, however, did not attend the piano class. Aware of the exceptional nature of Chopin's talent, Elsner allowed him, in accordance with his personality and temperament, to concentrate on piano music but was unbending as regards theoretical subjects, in particular counterpoint. Chopin, endowed by nature with magnificent melodic invention, ease of free improvisation and an inclination towards brilliant effects and perfect harmony, gained in Elsner's school a solid grounding, discipline, and precision of construction, as well as an understanding of the meaning and logic of each note. This was the period of the first extended works such as the Sonata in C minor, Variations, op. 2 on a theme from Don Juan by Mozart, the Rondo à la Krakowiak, op. 14, the Fantaisie, op. 13 on Polish Airs (the three last ones written for piano and orchestra) and the Trio in G minor, op. 8 for piano, violin and cello. Chopin ended his education at the Higher School in 1829, and after the third year of his studies Elsner wrote in a report: "Chopin, Fryderyk, third year student, amazing talent, musical genius". After completing his studies, Chopin planned a longer stay abroad to become acquainted with the musical life of Europe and to win fame. Up to then, he had never left Poland, with the exception of two brief stays in Prussia. In 1826, he had spent a holiday in Bad Reinertz (modern day Duszniki-Zdroj) in Lower Silesia, and two years later he had accompanied his father's friend, Professor Feliks Jarocki, on his journey to Berlin to attend a congress of naturalists. Here, quite unknown to the Prussian public, he concentrated on observing the local musical scene. Now he pursued bolder plans. In July 1829 he made a short excursion to Vienna in the company of his acquaintances. Wilhelm Würfel, who had been staying there for three years, introduced him to the musical milieu, and enabled Chopin to give two performances in the Kärtnertortheater, where, accompanied by an orchestra, he played Variations, op. 2 on a Mozart theme and the Rondo à la Krakowiak, op. 14 , as well as performing improvisations. He enjoyed tremendous success with the public, and although the critics censured his performance for its small volume of sound, they acclaimed him as a genius of the piano and praised his compositions. Consequently, the Viennese publisher Tobias Haslinger printed the Variations on a theme from Mozart (1830). This was the first publication of a Chopin composition abroad, for up to then, his works had only been published in Warsaw. In the autumn of 1831 Chopin arrived in Paris where he met many fellow countrymen. Following the national defeat, thousands of exiles, including participants of the armed struggle, politicians, representatives of Polish culture, such as the writer Julian Ursyn Niemcewicz, Romantic poets A. Mickiewicz and Juliusz Slowacki, and the Warsaw friends of Chopin, the poets Stefan Witwicki and Bohdan Zaleski, sought refuge from the Russian occupation in a country and city which they found most friendly. Chopin made close contacts with the so-called Great Emigration, befriended its leader Prince Adam Czartoryski, and became a member of the Polish Literary Society, which he supported financially. He also attended emigré meetings, played at charity concerts held for poor emigrés, and organised similar events. In Paris, his reputation as an artist grew rapidly. Letters of recommendation which the composer brought from Vienna allowed him immediately to join the local musical milieu, which welcomed him cordially. Chopin became the friend of Liszt, Mendelssohn, Ferdinand Hiller, Berlioz and Auguste Franchomme. Later on, in 1835, in Leipzig, he also met Schumann who held his works in great esteem and wrote enthusiastic articles about the Polish composer. Upon hearing the performance of the unknown arrival from Warsaw, the great pianist Friedrich Kalkbrenner, called the king of the piano, organised a concert for Chopin which took place on the 26th of February 1832 in the Salle Pleyel. The ensuing success was enormous, and he quickly became a famous musician, renowned throughout Paris. This rise to fame aroused the interest of publishers and by the summer of 1832, Chopin had signed a contract with the leading Parisian publishing firm of Schlesinger. At the same time, his compositions were published in Leipzig by Probst, and then Breitkopf, and in London by Wessel. In July 1837, Chopin travelled to London in the company of Camille Pleyel in the hope of forgetting all unpleasant memories. Soon afterwards, he entered into a close liaison with the famous French writer George Sand. This author of daring novels, older by six years, and a divorcee with two children, offered the lonely artist what he missed most from the time when he left Warsaw: extraordinary tenderness, warmth and maternal care. The lovers spent the winter of 1838/1839 on the Spanish island of Majorca, living in a former monastery in Valdemosa. There, due to unfavourable weather conditions, Chopin became gravely ill and showed symptoms of tuberculosis. For many weeks, he remained so weak as to be unable to leave the house but nonetheless, continued to work intensively and composed a number of masterpieces: the series of 24 preludes, the Polonaise in C minor, the Ballade in F major, and the Scherzo in C sharp minor. On his return from Majorca in the spring of 1839, and following a convalescence in Marseilles, Chopin, still greatly weakened, moved to George Sand's manor house in Nohant, in central France. Here, he was to spend long vacations up to 1846, with the exception of 1840, returning to Paris only for the winters. This was the happiest, and the most productive, period in his life after he left his family home. The majority of his most outstanding and profound works were composed in Nohant. In Paris, the composer and writer were treated as a married couple, although they were never married. Both had common friends among the artistic circles of the capital, such as the painter Delacroix and the singer Pauline Viardot, as well as the Polish emigrés, such as A. Mickiewicz and W. Grzymala. For years, the couple enjoyed a deep love and friendship, but with time the increasingly hostile attitude of George Sand's son, who exerted a strong influence on the writer, caused ever more serious conflicts. A final parting of ways took place in July 1847. Grievous personal experiences as well as the loss of Nohant, so important for the health and creativity of the composer, had a devastating effect on Chopin's mental and physical state. He almost completely gave up composition, and from then to the end of his life wrote only a few miniatures. In April 1848, persuaded by his Scottish pupil, Jane Stirling, Chopin left for England and Scotland. Together with her sister, Miss Stirling organised concerts and visits in various localities, including the castles of the Scottish aristocracy. This exceptionally hectic life style and excessive strain on his strength from constant travelling and numerous performances, together with a climate deleterious to his lungs, further damaged his health. On 16 November 1848, despite frailty and a fever, Chopin gave his last concert, playing for Polish emigrés in the Guildhall in London. A few days later, he returned to Paris. His rapidly progressing disease made it impossible to continue giving lessons. In the summer of 1849, Ludwika Jedrzejewiczowa, the eldest sister of the composer, came from Warsaw to take care of her ill brother. On 17 October 1849, Chopin died of pulmonary tuberculosis in his Parisian flat in the Place Vendôme. He was buried in the Père-Lachaise cemetery in Paris. In accordance with his will, however, his heart, taken from his body after death, was brought by his sister to Warsaw where it was placed in an urn installed in a pillar of the Holy Cross church in Krakowskie Przedmiescie.